To tackle appreciating the art of Spain, you can certainly hit the top highlights. That would include the Prado Museum in Madrid, arguably Europe’s greatest painting museum. Also in Madrid is Picasso’s Guernica, a monster painting that not only is a testament against modern warfare but is so much part of the Spanish history with its horses and bulls and weeping women imagery and gets right to the heart of Spain’s Civil War. I’d certainly put on the list the Alhambra in Granada. This is evocative of 700 years of Muslim settlement in Spain which we now think of this great Catholic country but for 700 years ago it was Muslim. The Alhambra is a lush Arabian-nights-wonderland is the best place to appreciate the Muslim settlement of Spain. Finally there’s Gaudi’s unfinished Cathedral of Sagrada Familia in Barcelona. This gives the grandeur of Spanish dreams into this cake-melting-in-the-rain sort of architecture with the soaring towers this become very much the symbol of the city of Barcelona. The Prado Museum’s incredible wealth of paintings is my favorite collection of paintings from all of Europe. Madrid has so many art treasures because it was the capital of the Spanish colonial empire. The Prado’s collection is illustrative of the how important Spain was in the past. There are a lot of famous Flemish paintings there because the Netherlands was actually a Spanish colony. The Guernica, located in Museo Nacional Centro de Arte Reina Sofia, Spain’s National Museum, is incredible painting by Picasso. In a lot of ways it is the painting of Europe—when you talk about the struggles of the 20th century. The reason why Guernica is located in Madrid is that Picasso was the curator of the Prado Museum during those 12 years in the Spanish Civil War and that is always his cubist interpretation of the Spanish Civil War. The message is absolutely bleak, with direct impact. In black and white, the piece has the importance of a newspaper photo. Flailing bulls and horses illustrate that the visceral horrors of war are not just an insult to human civilization, but to human life. 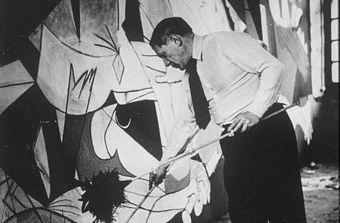 For many years Picasso’s Guernica was actually in exile in New York City and that’s because Picasso insisted that the painting was so much against the then dictatorial government of Spain, led by Francisco Franco. Picasso would not allow his painting to be in a Franco-ruled Spain and it wasn’t until Franco finally died and a new democratic regime came in to power that that painting could be repatriated and brought back to its homeland. Guernica is a vast canvas in solemn tones of grey and blue, it shows in scorching detail the suffering of people and animals as bombs fell on their town. Guernica is actually a town in the Basque Province of northern Spain, to the east of Bilbao. Formerly the seat of a Basque parliament and it was bombed in 1937 during the Spanish Civil War, by German planes in support of Franco. This event is depicted in the famous painting by Picasso. Picasso’s painting of the bombing of Guernica is one of the 20th century’s most famous images. Franco died in 1975, but sadly Picasso died two years before that and he lived to see the day when his most famous painting went back to his homeland. Picasso pledged that neither he nor this painting would ever pay a visit to Spain until democracy was restored. This did not happen until 1978, five years after his death.